Hi everyone. Time for another challenge over at the Glitter 'n' Sparkle Challenge Blog. Everyone's favorite - absolutely anything, whatever crafty project you have been working on this week, we love to see what you come up with and with Anything Goes the sky is the limit. We have a wonderful prize for you from our Sponsor - Ppinky Dolls - who is offering 3 images from their store. For my card this week I chose to use the gorgeous image - Pegasus. 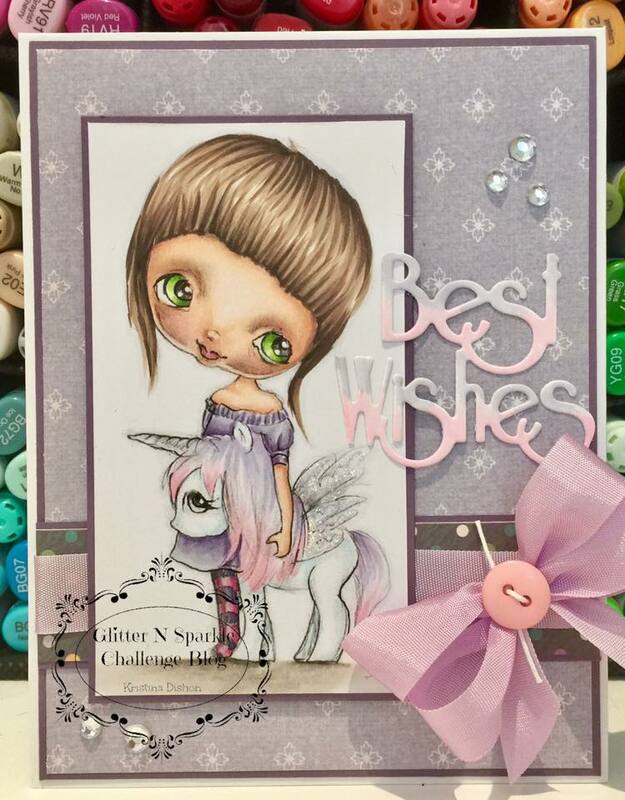 So many cute images to choose from, but I am going for a bit of a Unicorn theme at the moment - lol - from mermaids, to fairies, and now to unicorns! Says a lot for where my reality is!! I have coloured the image with copics and used some diamond stickles on the wings.